When you’re looking for the best places to eat seafood in Seattle, it’s important to know that there is no shortage of places to eat seafood in Seattle. With the city’s location right on the Puget Sound and not far away from the Pacific Ocean, seafood is plentiful, fresh and popular. Look for Northwest specialties like salmon in its many varieties, dungeness crab or razor clams, but whatever you eat, if it’s from the sea, you can generally count on it being delicious. Here’s a list of places to enjoy local seafood whether you want something to snack on, a casual dining experience or an upscale meal. 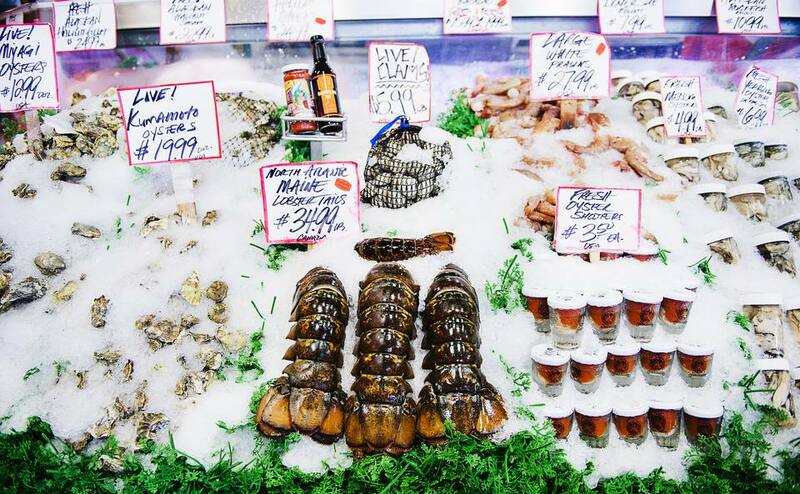 Some of the freshest and most affordable seafood in town is at Pike Place Market. The famous fish market at the entrance mostly serves up fish to take home, but there are ready-to-eat crab and shrimp cocktails as well as oyster shooters you can buy here too. These small bites make an ideal way to enjoy some seafood on the cheap. Ivar’s is a chain of local fast casual restaurants founded by Seattle restaurant owner, folk singer and personality Ivar Haglung in 1938. Today, there are a few different Ivar’s locations, including Ivar’s Acres of Clams (the first Ivar’s restaurant) on the waterfront, the sit-down Ivar’s Salmon House on Northlake Way, and Ivar’s Seafood Bars located all over. At any location, expect to find various versions of fish and chips as well as salads, chowders and more. The restaurants are casual, but yummy. Tom Douglas is one of Seattle’s top chefs and he owns a group of restaurants, all situated in downtown Seattle. While not all of these restaurants have an expansive seafood menu, all have fresh local ingredients at the forefront, which often means seafood. The best Tom Douglas choices for seafood choices include Etta’s, which is near Pike Place Market and has chowder, fish and chips, Dungeness crab and clams, and “Rub with Love” Salmon – one of Tom Douglas’s signature dishes. Seatown seabar near the market and Dahlia Lounge are also worth looking into the seafood options. Located on Seattle’s waterfront at Pier 56, Elliott’s Oyster House has served fresh, local seafood since 1975. Dine inside or dine outside on the deck overlooking Elliott Bay and you’ll have a great experience either way. You might guess from the name, but you’ll find oysters here… lots of oysters! Try Oysters Rockefeller, or pan fried oysters, or try one of a few different varieties raw and on the half shell. But oysters aren’t for everyone and Elliott’s knows that. You can also find wild salmon grilled, planked or seared, as well as other seafood dishes. Another local chain is Anthony’s, but while the restaurants are within the same family, each tends to be a bit unique – some are more casual, some are nicer. Finer Anthony’s restaurants include Anthony’s Pier 66, which serves fresh fish, shellfish, crab and more. More casual options include Chinook’s on Salmon Bay and Anthony’s Bell Street Diner, both of which are still sit-down restaurants, but with a lighter atmosphere and menus still filled with wild-caught seafood of all sorts. Salty’s on Alki is not the only Seattle seafood spot with a view, but it has hands down one of the best views. Situated on Alki Beach across the water from downtown Seattle, you can dine on fresh seafood while gazing upon one of the finest views of Seattle’s skyline anywhere. All seats have a great view, too, but window seats are especially great. Ballard’s roots are as a Scandinavian fishing community and those roots shine through at The Walrus and the Carpenter – a clever name for a place that specializes in super fresh oysters. The menu also features non-oyster seafood, ranging from salmon to sardines, and changes daily to showcase the freshest seafood the restaurant can get. The restaurant itself is cute and cozy… and popular. Expect a wait during peak times. If you’re in the mood for a walk, stroll up to the Hiram M. Chittendam Locks and watch the boats come and go, or cross over the locks and see if there are any salmon climbing the salmon ladder (which is at its peak in the summer and early fall). Want your seafood served up in a chic and modern atmosphere? Blueacre Seafood is the place for you. Higher end and just the right amount of ritzy, Blueacre has a full menu of seafood with unique options you won’t find just anywhere. Poulsbo Viking Pickled Herring? Potato chip encrusted fish and chips? Maine lobster? Seafood afficianados won’t be disappointed. The restaurant is right downtown, too, and pairs nicely with a night out at the Paramount Theatre, which is close by. Ray’s Boathouse combines a great view of the water with a classic dining experience. The restaurant is a bit historic, opened as a café in 1939 by Ray Lichtenberger. It’s been through a few incarnations since, including burning to the ground in 1987. Today, the restaurant has a casual and maritime atmosphere, and stellar quality seafood with a focus on sustainable seafood from both local and global sources. The menu features seafood you won’t find just anywhere, such as sablefish and butter poached Maine lobster tail.